Continuous monitoring means that you will immediately see when a dangerous or costly gas leak appears so that immediate action can be taken. Optical gas imaging (OGI) cameras are widely used in industrial settings such as oil refineries, natural gas processing plants, offshore platforms, chemical/ petrochemical industries, and biogas and power generation plants. OGI cameras like the FLIR A6604 can detect harmful greenhouse gases that can seriously harm the environment. 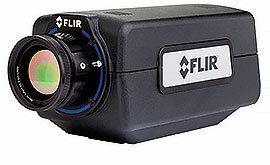 FLIR A6604 contains a cooled Indium Antimonide (InSb) detector that produces thermal images of 640 x 512 pixels. More pixels give you a wider field of view so that you can monitor larger installations. It also offers an ultra-crisp image. Benzene, Ethanol, Ethylbenzene,Heptane, Hexane, Isoprene, Methanol, MEK, MIBK, Octane, Pentane, 1-Pentene, Toluene, Xylene, Butane, Ethane, Methane, Propane, Ethylene and Propylene.